WHAT: In-store signing of the new Medal of Honor Soundtrack Collection Box-set. WHEN: Saturday, April 16 from 2-3 PM. 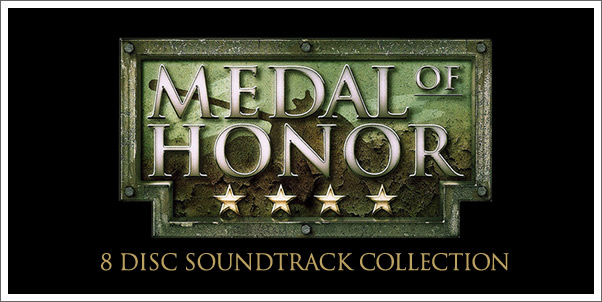 * To celebrate the release of the Medal of Honor Soundtrack Collection, an eight disc box set showcasing Medal of Honor music by composers Michael Giacchino (UP), Ramin Djawadi (IRONMAN), and Christopher Lennertz (HOP). * Box set includes previously unreleased material from the videogame series, a 40-page booklet with track listings, and introduction by game creator, director Steven Spielberg. Additional Information: Also in attendance will be composers Mark Islam (Crossing Over), Cliff Martinez (The Lincoln Lawyer), Stu Phillips (Battlestar Galactica), Scott Glasglow (Low), Ryan Shore (Jack Brooks Monster Slayer), and Jeremy Zuckerman & Ben Wynn (DC Showcase). Medal of Honor is one of the most popular video game series. Part of the popularity is due to the videogames' scores. The series completely revolutionized the gaming experience with quality scores performed by full-orchestras and written by composers who would go on to win Oscars and other awards. EA (Electronic Arts) and La-La Land Records have joined forces to release the Medal of Honor Soundtrack Collection, an eight disc box set jam-packed with gamers' favorite Medal of Honor music from the series. To celebrate the release of limited edition box set, The games' composers Ramin Djawadi and Christopher Lennertz will be at Dark Delicacies in Burbank on Saturday, April 16 at 2 PM. to sign the limited edition Medal of Honor box set. The MOH music was written by Djawadi (IRONMAN), Lennertz (HOP), and Academy Award-winner Michael Giacchino (UP). In addition to MOH, other composers will also be signing CDs including Mark Isham, Stu Phillips and Cliff Martinez.